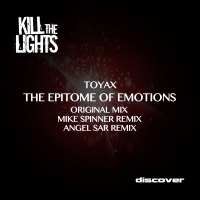 Next up on KTL is Toyax with The Epitome of Emotions and with three mixes on show here the title is nailed on. The original mix is infectious to the extreme with a dark twist brought to the fore by a sinister topline that opens into the breakdown into a feast of tribal trums, big chords and epic twists. It definitely breaks more than a few rules in the very best of ways. Mike Spinner, fresh from the success of his recent Para X remix which was licensed by Sony and topped many of the cooler download charts, adds a cool twist and lightens the original into more mainstream trance territory. Angel Star goes for the jugular with a total revamp of the groove which does not sit still for a second and finishes the package perfectly. 'The Epitome of Emotions' is available now from Beatport and iTunes.